As 2014 comes to an end, so too does our look back at the ARIA top 50 singles charts from 1989. 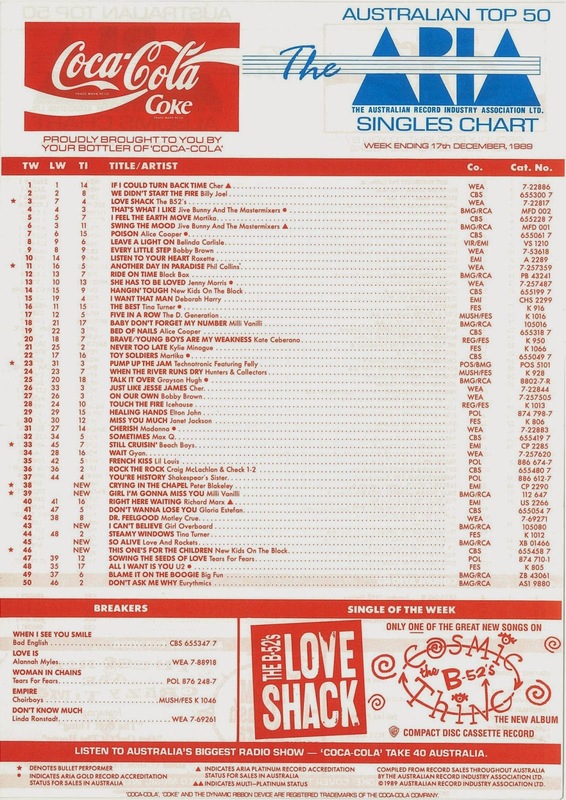 Fear not, after the obligatory three-week break during which ARIA used to pack up and go on holidays (despite the fact that the festive season is the peak record-buying period of the year), the chart returned in early 1990. And so, on January 7, I'll return with the first top 50 for the '90s - mark your calendars now! Next year, I'll also start looking back 30 years each week as well. Why? Well, although I didn't personally collect the charts in 1985, I have managed to get my hands on every chart from that year. And it was 1985 - a year that deserves revisiting beyond my own previous posts on the subject. Back to 1989, and before we get to the week's new entries, respect must go to Cher and "If I Could Turn Back Time", which spent a seventh and final week at number 1 - and thankfully held off a challenge for the top spot from Billy Joel and kept Jive Bunny's run at number 1 mercifully short during that stretch. 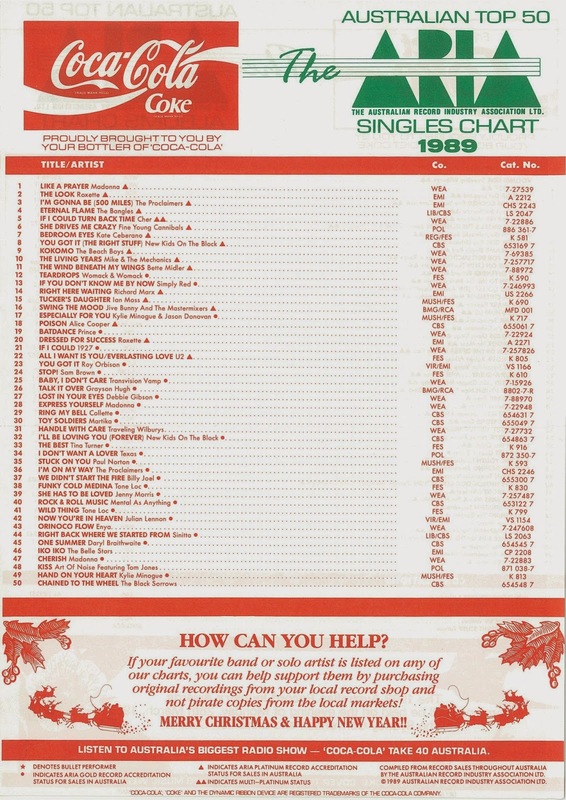 In the first chart for 1990, we'll see what song became the first number 1 for the '90s and benefitted from the Christmas shut-down by registering three weeks at the top in one go. Cynical marketing ploy or touching seasonal record? Either way, the decision for NKOTB to get festive at the peak of their success was a guaranteed money-spinner... at least, in the US, where "This One's For The Children was a half-million-selling number 7 smash. Even though Australia was still one single ("Cover Girl") behind the States in the New Kids release schedule, "This One's For The Children" was rushed out here to take advantage of those holiday sales, such as they were. The accompanying album, Merry, Merry Christmas, also made the ARIA chart - peaking at number 34. The UK was even further behind the eightball when it came to New Kids, and both single and album were delayed until Christmas 1990 there. Love And Rockets was formed by three of the members - everyone but the vocalist - of goth rock band Bauhaus (biggest hit: a 1982 cover of David Bowie's "Ziggy Stardust"). This spin-off group had released three albums before their 1989 self-titled LP, which contained breakthrough hit "So Alive". While much more commercial than Bauhaus's music, the track still had a bit of a dark edge that set it apart from pretty much everything else on the chart. "So Alive" also reached number 3 in the US and would be the only substantial hit for Love And Rockets. In theory, this was the debut single for the band fronted by singer Lisa Schouw, but Girl Overboard had been around - and releasing music - for a while as Separate Tables. Between 1987 and 1989, the band put out three singles, two of which made inroads into the top 100 ("When The Word Came Down" reached number 82 in February 1988, while "Wrap Your Arms Around Me" managed a peak of number 71 in May 1989). Things obviously weren't quite working, and so Separate Tables morphed into Girl Overboard. The rebranding did the trick, with the freshly renamed band finally able to crack the top 50 - albeit for only two non-consecutive weeks. Still, it was a start. "Baby Don't Forget My Number" was proving to be an incredibly durable single, still bouncing around the top 20 despite being 17 weeks into its chart life - a top 50 run that would end up lasting more than twice that long. And so, rather than release "Blame It On The Rain", which had been the next European single, Milli Vanilli's Australian record company followed the American lead and skipped ahead to ballad "Girl I'm Gonna Miss You", which would wind up as the deceitful duo's highest-charting song in Australia. It was also my least favourite single by the group. Peter Blakeley's story is one of those classic music industry tales - the Australian singer had done the rounds as a session musician and guest vocalist (including for a pre-success incarnation of Rockmelons in 1985) for years before finally getting his own record deal in 1986, and then another one in 1988. It would take a few more years for Peter to land a hit, but he made up for lost time with this original track - not, as it's often mistaken to be, a cover of the identically named song performed by artists as diverse as Elvis Presley, Bob Marley & The Wailers and The Platters. The lead single from his Harry's Cafe De Wheels album, it would shift enough copies to place in the top 20 highest-selling singles of 1990 in Australia. Ruling the roost for 1989 was Madonna, who not only had the year's highest-selling single with "Like A Prayer", but also placed twice more in the top 50 with "Express Yourself" and "Cherish". Madonna was one of six artists with two or three songs on the annual chart - seven, if you include Roy Orbison, whose solo single "You Got It" appeared alongside The Traveling Wilburys' "Handle With Care". The highest-placed Australian single didn't even make number 1. Perennial runner-up "Bedroom Eyes" by Kate Ceberano was the seventh biggest single for 1989, and was one of 11 songs by local acts (including New Zealander Jenny Morris, who was based in Australia). That figure also includes two entries by Kylie Minogue, who was increasingly not based in Australia as the year wore on. 1989 was the year when gold and platinum accreditations started being shown on the ARIA top 50 - and what was interesting about this year-end chart was that multi-platinum hit "If I Could Turn Back Time" was only placed fifth, while 12th placed "Teardrops" only went gold but registers higher than many platinum accredited singles. Of course, what became apparent was that a gold or platinum record didn't necessarily sell 35,000 or 70,000 copies (respectively), but they indicated the record company had shipped that many copies to stores. Whether or not they sold was another matter. If you're interested in what I was listening to in 1989, you can find my personal top 100 for that year here. And I'll be counting down my top 100 songs for 2014 on this blog in the last week of the year. It's sad to see the 80s (and, for me, Breakers where the peaks haven't been published before) come to an end... but there's always the possibility of an occasional Single of the Week that missed the top 100 coming up. Thanks for posting this era of charts - before discovering your blog, I didn't think I'd ever get to see them again, and the 1988 and 1989 charts were of particular interest to me. I have wondered sometimes why the ARIA chart took a 2 week break most years before 1997, but only a 1-week one in some (Xmas '88 and Xmas '94, where the last published chart fell on Xmas day). 'This One's For the Children's low peak, even if it was a sort-of Christmas record, was a sign that NKOTB were on the way out. If anything, the Xmas album probably damaged their image of being a slightly 'hard' (well, for tweens) street-wise group. 'So Alive' was played quite regularly on Melbourne FM radio, but seemed to be virtually forgotten a few months later. I thought Girl Overboard's 'I Can't Believe' deserved to do much better than 43 on the charts. It's a pity that this wasn't their big hit, instead of 'The Love We Make'. There was a different (and much better IMO) video filmed for the US market in 1991, which I got hold of a few months ago and uploaded here - https://www.youtube.com/watch?v=ZkXsl64BdrM . I have wondered why 'Girl I'm Gonna Miss You' had 'Girl' added to the title for its single release. I suspect the song would still get some rotation on easy listening radio stations if the miming scandal wasn't uncovered and they weren't thought of as being a joke. I really did not like 'Crying In the Chapel' at the time, but it's grown on me a bit since then. I wonder where they sourced this from? I was surprised to see Like a Prayer end up as the year's biggest seller, though I guess it makes sense since it spent so long hovering between #1 and #3. When I picked up the 1989 annual chart, I noticed that Cher's 'If I Could Turn Back Time' now had multi-platinum status; the first time this was denoted on the printed chart. I was puzzled then why it wasn't the #1 single of the year, and why there's a couple of gold singles placed higher than platinum singles, and even a handful of singles with no accreditation placed higher than gold singles. Obviously I didn't know the difference between shipments and sales yet - but it's still a bit strange to see a single with no accreditation as high as #31. 'Handle With Care' charting over the period where ARIA switched from 50k shipments to 35k shipments for gold might be the explanation. In the ARIA accreditations thread on the australian-charts.com forum, I noticed that Yazz's 'The Only Way Is Up' received a gold award in 1988 (for presumably 50k shipments), and then another gold award in 1989 (presumably for 35k shipments on top of that)... which would bring the total to >70k shipments, sufficient for platinum in 1989. Perhaps ARIA didn't 'grandfather' in singles charting before 1989 to the new, lower shipment requirements for awards? I remember finding positions 51-100 for the 1989 annual chart online some time in 1999 or thereabouts, when searching for ARIA top 100 information. I assume that the full top 100 was sent out with the first ARIA Report? The other Gavin who compiled the ARIA chart books wasn't aware that 51-100 were ever published until just before sending off the final print copy to be published for his 1988-2010 charts book. That data made it to the book just in the nick of time. I remember finding the 'please buy legitimate releases and not dodgy counterfeit copies from your local market' spiel at the bottom of this chart amusing. I remember the days when a nearby market openly sold cheap cassette copies of charting albums for about $10 a pop. Yay - looking forward to the 1989 look backs. Thanks!!!! Sorry to see the 80s come to an end, especially loved seeing the breakers. Interesting that "Oh Father" didn't quite make it - seems #51 on AMR was not near enough on ARIA! Thanks for everything you've posted. Looking forward to 1990 and especially 1985 - my favourite year in music. Thanks for all of these! Looking forward to future posts, particularly 1985. I felt happy that there will be 5 final singles to enter the ARIA Top 50 of the 1980s and it was the first two years of ARIA Top 50 Singles. I felt sad that "Empire" (Choirboys) didn't make it to Top 50. I'm very excited for the upcoming posts about Australian Top 10 One-Hit Wonders of 2000's, posts on ARIA Top 50 Singles Charts: 1990 (which is my favorite year on music) and of course, post on Australian Top 10 Two-hit wonders of 2000's and looking forward to it! Thanks! 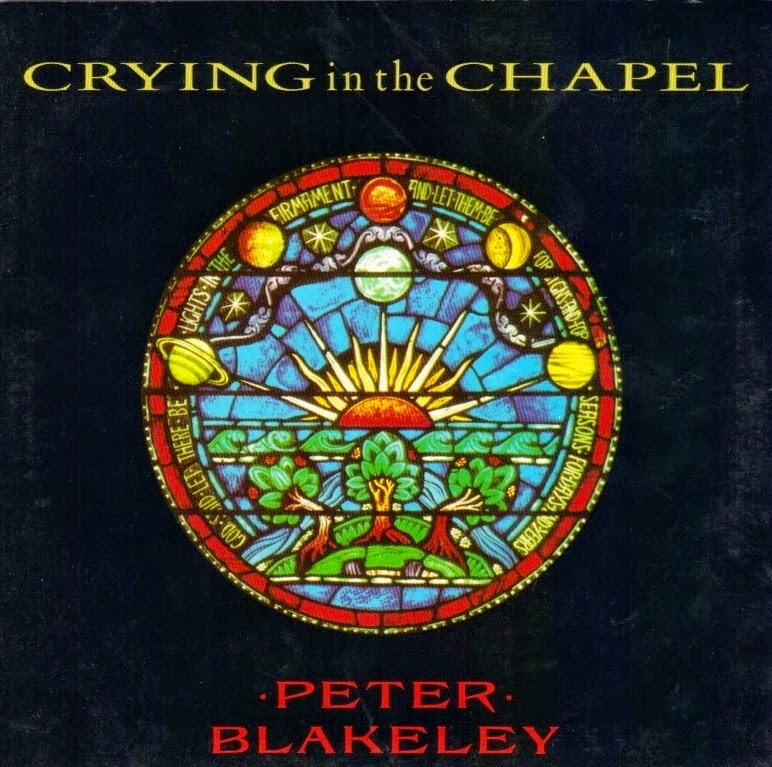 I did not know that PB's 'Crying In The Chapel' was a cover. I didn't mind it back then, but like Nathan, it has really grown on me over the years. The song slowly builds and builds and goes off! My best friend looked a bit like PB and in College everyone called him Peter Blakely. Looking at the video, it was definitely made for the American market? Did it chart there and if so, what No.? I remember the Love & Rockets video well. Who could forget those long pairs of legs strumming away to the music? Lisa Schouw was everywhere in the early 90's. She and the band got a lot of exposure back then. Nathan, I stumbled across the US video a couple of months ago. I like both video versions. 'Girl I'm Gonna Miss You' is my fave Milli Vanilli single. I do like the 12" and I forgot to mention last week, Taylor Daynes 'With Every Beat Of My Heart' is a great 12" too. Once again, I did not know that NKOTB 'This One's For The Children' was a festive single and they had a Christmas album. It was that one song that was quickly squeezed in between 'Hangin' Tough' and 'Cover Girl'.